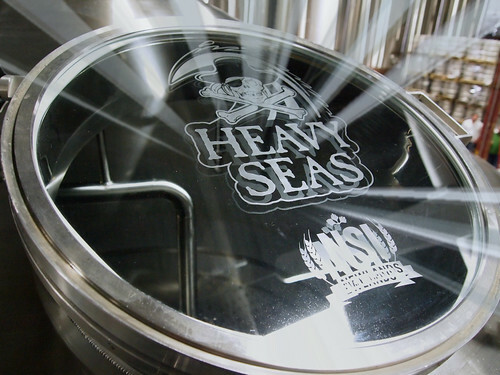 Looking at the glass door on one of the two new kettles at Heavy Seas Beer, during a ribbon-cutting ceremony at the Baltimore, Maryland-area brewery, celebrating the official launch of the brewery's new brewhouse, bottling line, and expanded production area. The new system consists of a mash mixer, a lauter tun, two 60-barrel kettles, and a whirlpool tank. Having two kettles gives the brewers a more flexible brewing schedule. That and the larger kettle size yield a daily production capacity of two-hundred-forty barrels. The original brewhouse was a 3-vessel system with a 50-barrel kettle. It was installed at Heavy Seas, new, in 1995, when the brewery, then known as Clipper City Brewing, began operations. The brewhouse will be dismantled and shipped to Texas, where it will get a new career, in its retirement, at a 'craft' distillery. A barrel is not a physical thing. It's a unit of measurement, equal to 31 U.S. gallons. One barrel yields about 13.7 cases of 12-ounce beers. More on beer volumes and measurements: here. Yes, I touched up the photo a bit, using the "radiance' feature of the online PicMonkey. More photos from the ceremony: here. Caveat lector: As a representative for Select Wines, Inc. —a wine and beer wholesaler in northern Virginia— I sell the beers of Heavy Seas. Opinions expressed are not those of my employer.